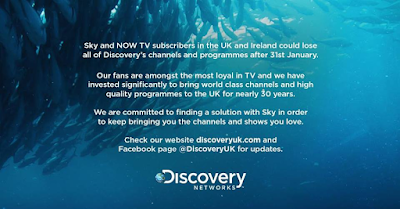 The war of words between Sky and Discovery has escalated, hours after Discovery revealed its channels - including Eurosport - might be pulled off Sky and NOW TV after 31st January. 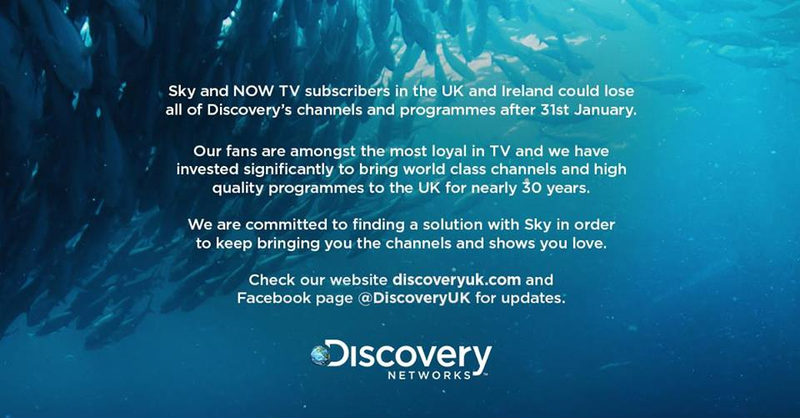 Sky has blasted Discovery Networks saying the new carriage deal being proposed by the US media giant was not "sensible". In a sign of deadlock, it is telling viewers that the channels are coming out of Sky's subscription packages on 1st February 2017 and advising them of alternative factual and sports content on the Sky TV platform. Discovery, meanwhile, has only been talking about the channels being "at risk" of coming off Sky after the end of the month. Discovery went public about having failed to reach a carriage deal with Sky at the close of play on Wednesday. It accused Sky of abusing its dominant market position with regards the amount it receives from Sky for the carriage of its channels in the Sky TV subscription packs, asserting that more viewers watch Discovery's channels than ever before, including Eurosport - the new home of comprehensive Olympic TV coverage. Within hours it had launched a multi-media campaign involving websites, on-screen tickers and adverts as well as social media advising viewers of the possibility of Discovery being pulled off Sky. Using the hashtag #KeepDiscovery it has been trying to get viewers involved in the campaign to avert the loss of Discovery and its sister channels on Sky. By late evening, Sky was fighting back, claiming Discovery's demand for more money was not "sensible" and that as a result they had chosen not to renew the carriage contract. Earlier in the evening, Discovery said 12 of its channels will be affected: Discovery Channel, TLC, Eurosport 1, Eurosport 2, Animal Planet, Investigation Discovery, DMAX, Discovery Turbo, Discovery Shed, Discovery Science, Discovery History and Home & Health. But Sky has now said Quest will also get the chop, although it's possible Quest could turn into a free-to-air channel on satellite beyond the end of January - it is already carried on Freeview, but still encrypted on Sky stopping Freesat users from accessing the channel. On NOW TV, the main Discovery channel is part of the Entertainment Pass and is also under threat of removal. Sky and Discovery settle dispute - affected channels will continue to be available on Sky. Sky has in recent years been offering less money to channels, and as whereas 8-10 years ago new standard definition channels were being taken behind Sky's paywall, in recent years more channels have opted to come out of Sky's subscription packs (such as the Box Plus Network music channels, PBS America, Really, Yesterday and Drama), while new Freeview channels have also launched as free-to-air services on satellite (e.g. Blaze, TruTV, YourTV), in contrast to the time when Freeview channels such as Quest launched, when the satellite versions of the channels were routinely encrypted and restricted to Sky subscribers. But Sky, alongside other traditional pay TV operators is finding itself squeezed between paying ever higher costs for sports rights and viewers switching to on-demand TV services, meaning a Sky box is no longer the primary way to access additional content, particularly for younger viewers. Will Discovery's channels come to Freeview? It is unlikely, as the majority of the channels are based around pay-TV models, and without the revenue from subscription fees, it's far from certain some of the niche channels would be able to survive from advertising alone. Adding the channels to Freeview would also devalue existing carriage deals with other pay TV providers, such as Virgin Media. Also there isn't the available capacity on the market at the moment to make all of Discovery's channels available widely on Freeview. However, Discovery does have a timeshift of Quest, Quest+1 on Freeview channel 38. With the boom in on-demand viewing, its arguable the +1 could be replaced with a different free-to-air service from Discovery. For the record, standard definition versions of its DMAX and TLC channels are free-to-air in Germany, Austria and Switzerland, as is Eurosport 1, but the TV market is different. How will this affect Olympic coverage? Hopefully a resolution will happen before 2018, when Eurosport's coverage of the Winter Olympics starts (A similar spat between Sky and Virgin took over a year to fix in 2007-2008). However, the BBC will continue to show coverage free-to-air - it is the additional layers of coverage such as that shown on the BBC Red Button service that will be shown on Eurosport in the future, and an increasing number of smart TVs support the Eurosport Player, through which access can be granted. Has this happened to Discovery on other platforms? TalkTalk lost access to the Discovery channels at the end of June 2016. Has this happened to Sky before? Sky has been pruning carriage deals in other territories in which it operates. Claiming it wanted to focus more on exclusive content for subscribers, a carriage deal with Germany's second largest commercial operator (ProSieben Sat.1 group) concluded without renewal last year resulting in Sky Deutschland subscribers losing access to a number of pay TV digital channels. Discovery ended its exclusive Sky carriage deal for Eurosport 1 HD (not to be confused with the free SD channel), effective 1st December 2016. And now Discovery is looking at completely terminating its distribution via Sky Deutschland next week, according to reports coming in from Germany. Where would I be able to see Discovery's channels if they are pulled from Sky? Eurosport and other Discovery channels are available via BT TV, Plusnet TV, Virgin Media and TVPlayer. At 19:00 25/01/2017, first reports of the dispute between the two companies emerge as a statement is released by Discovery. By 20:00 25/01/2017, Discovery Networks has begun an information campaign to alert viewers. Discovery UK website redirects to special "Keep Discovery" site. I can kind of see Sky's point. The documentary channels are often filled with reality rubbish and can't be that much of a pull for subscribers as they once were.